Channa is the scientific name for a group of fish species commonly known as Snakeheads. Snakeheads are also sometimes called Frankenfish. Snakeheads have received a lot of attention recently, due to the fact that Snakeheads have been found living and breeding in North American waters. Since the Snakehead is native to south eastern Asian and not a natural part of the ecosystem of North America, it is capable of seriously disrupting the American ecology. The Snakehead is an accomplished predator and the largest individuals reach a length of almost a metre (roughly one yard). In North America, Snakeheads have primarily been found in Maryland. Snakehead fish can only survive in parts of North America that provide a climate similar to the Snakeheads native home regions in south eastern Asia. The Snakehead needs warm waters, and even if they could tolerate cold they would experience sever problems in a frozen lake since this type of fish breath oxygen from the air. Breeding air from the atmosphere is an adaptation developed by the Channa species during their long history in low oxygen waters. An additional benefit is that if the water where the Snakehead lives becomes dried out during a draught, the fish will crawl to a new home, using this remarkable capability of breathing oxygen from the air. As a result of the wild and breeding populations of Snakehead found in the U.S., many states made it illegal to keep snakeheads. In 2003 a nation wide ban was instituted that forbids all import of Snakeheads to the United States. 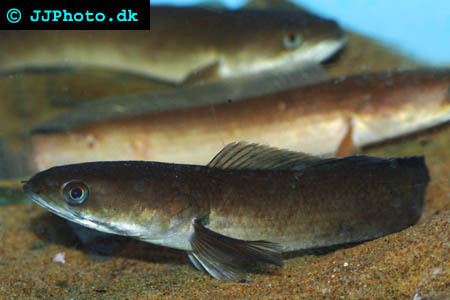 It is however still possible to find Channa species in some fish stores, especially on Asian fish markets since the Snakehead is a popular delicates in Asia. A lot of aquarists are upset about the national ban, and claim that it should be legal to import Snakeheads to regions of the U.S. where the climate makes it impossible for the fish to survive in the wild. The Snakeheads are fascinating species to keep in aquariums, but most species will eventually grow too large for the average aquarium keeper. Always consider this before you get a Snakehead for your aquarium, and find out exactly how big that particular species can grow. Also avoid buying a Snakehead if you don’t have a large fish-food budget. The fact that Snakeheads ended up in the U.S. fauna in the first place is probably partly due to irresponsible aquarists. When their Snakeheads grew too large to house or turned out to be too expensive to feed, they simply released the fish into the wild. There are a few Channa species that do not grow as large as their relatives, and those species are naturally more suitable as pets. All adult Snakeheads are very territorial and it will often prove impossible to keep several Snakeheads in the same aquarium, even if it is large. Channa species are very tough and will tolerate alkaline waters as well as an acidic pH value. Channa fish will also survive quite poor water quality, but a better water quality is naturally preferred. Snakeheads are generally very undemanding fishes and will do well as long as they are kept in warm water. Most Channa species will prefer planted aquariums with plenty of hiding places. A majority of the Channa species also require plants to spawn. Particularly young Channa fish will become much stressed if kept in an aquarium without places to hide. Since there are many different Channa species, you need to find more information regarding your exact species before you decorate the aquarium, since the preferred environment does vary between the species. For all Channa species you need to secure all aquarium decorations safely. Larger rocks should ideally be placed directly on the glass. Since the Snakeheads breathe oxygen from the air, Snakeheads must have access to the air at all times. If they are prevented from reaching up over the surface of the water they can drown. All Channa species are very strong jumper, so you will have to find a way of covering the aquarium without denying the fish access to air. When your Channa is very young it is capable of absorbing oxygen from the water instead, but this capability will soon be lost as the Channa grows older. Any fish that is smaller than 2/3 of the Snakehead will be considered prey, and should not be kept in the same aquarium as a Snakehead. The mere fact that the fish is to large for the Channa to swallow, will not mean that it is out of harms way. The Channa will simply take bits out of the smaller fish and consume it gradually. Your Snakehead will eventually eat pretty much anything you feed it. Before you have made your Snakehead accept dead food it will require live food, and Snakeheads will always love live food even after they have been trained onto dead foods. It is however very easy to make Snakeheads accept dead food, and once they find out that dead things can be tasty they are known to taste all dead things in the aquarium, including heaters and aquarium decoration. Your Snakehead will require a lot of food and accordingly produce a lot of waste products, so weekly 50% water changes is a minimum. Many Snakehead species breed in ponds and aquariums as long as the environment is planted and large enough. Some Snakehead species are mouth brooders, and will care for their young. If you want the Snakehead fry to survive once the fry are free swimming, you need to separate larger fry from smaller fry. Channa fry are very predatory and cannibalistic. Channa fry sometimes form schools, and sometimes not. Alligator Gar - An article about Alligator gars in the wild, and some of the treats to the alligator gar population. Channa bleheri / The Rainbow snakehead - Channa bleheri. Freshwater Sawfish - An introduction to freshwater swordfish and their present endangered status. Pufferfish - An introduction to Pufferfish.